February 11, 1968. Millions of television viewers around the world, many of whom were watching the Winter Olympics for the first time, gazed in awe as a pretty brunette in a pale green dress took her place in figure skating history. 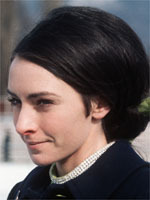 Peggy Fleming's brilliant performance on the ice, which earned her the ladies individual gold medal ahead of her East German rival Gaby Seyfert, along with Frenchman Jean-Claude Killy's three gold medals, was one of the highlights of the Grenoble Games and earned her the nickname of "the ice fairy". The French audience, still discovering the charm of figure skating, were quickly won over by the grace and elegance of the young American, who was coached by former European champion Carlo Fassi of Italy. After sixth place at the Innsbruck Games in 1964 and third place finish at the world championships a year later, Fleming showed she had become a force to be reckoned with at the 1966 and 1967 championships when on both occasions she finished top of the podium. Her only worry was the huge weight of expectation, but in the end she proved herself more than capable of rising to the challenge. After her triumph in Grenoble, Fleming returned to a spectacular reception both from the media and an adoring public in the US, not least because she had become the only American athlete to win gold at the 1968 Games. Soon there was little we didn't know about the young Californian, including the death of her father two years earlier and the story of that famous green dress, which had been carefully embroidered by her supportive mother. Following her Olympic success she added a third world title to her impressive resume before turning to a more relaxed career as a professional performer. Soon after her 1968 success, US President Lyndon Johnson invited her to the White House for what was perhaps the most prestigious tribute to her achievements. With her place in Olympic and American folklore assured, Fleming became a figure skating commentator for a television network, and was inducted into the American figure skating hall of fame in 1976. There was drama in 1998 when she was diagnosed with breast cancer but she stated philosophically: "These are another Olympic Games, The Olympic Games of life". She married a dermatologist, has two children and is now a grandmother. Fleming lives in the San Francisco region of California.